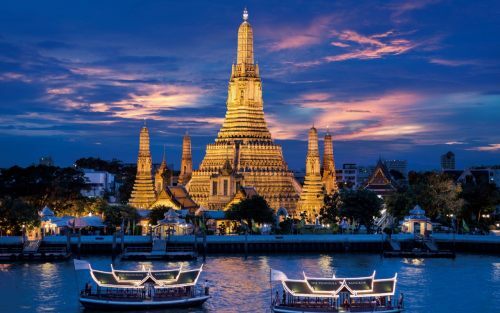 ANA (All Nippon Airways) is showing some cheap flights from Saskatoon to Bangkok, Thailand for $647 CAD roundtrip including taxes. ANA is a really great airline, ranked #3 worldwide this year. The flights between Saskatoon and Vancouver are usually operated by Air Canada. On the way there, the flights have a really long layover in Tokyo, Japan for 22 hours. This could be seen as a bonus, a bit of a break on the long journey to Thailand and a chance to check out Tokyo for the day. Try scrolling down through the results and look for the flights with 44 hours of travel time on the way there (this includes the 17 hours in Tokyo) and around 26 hours of travel time on the way home. Also note that in some cases the flight price will be cheaper on Momondo than when you click through to the booking site. The booking site you are attempting to click through to is GoToGate. Other booking sites may not work. In some cases you may need to click on 'See Details' and then 'Show All Booking Sites' to find GoToGate. On some dates, when your Momondo search completes, you may need to click on 'Load more results' to see all of the flight options. IMPORTANT: Double check the flight details when you get to GoToGate. Make sure it has the layovers you expect, and is on the dates you expect. 3. Try using start and end dates from the list of regular roundtrip flights above. And then experiment with the middle date to give yourself more or less time in Japan vs Thailand. NOTE: The first result that shows up on Momondo may be the cheapest, but it's also quite likely not the best option. Scroll down through the results and look for flights with travel durations that are similar to the screenshot below. For these flights, you can try clicking through to other booking sites beyond just GoToGate. It usually seems to work. The flight between Tokyo and Bangkok may be operated by United Airlines.